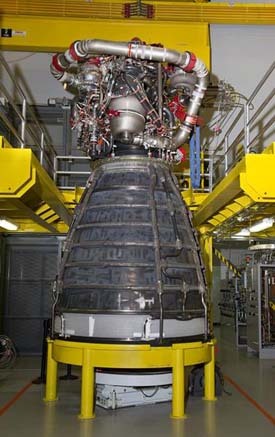 Aerojet Rocketdyne’s AR-22 engine, derived from the Space Shuttle Main Engine that was designed from the outset for reusability, is the main propulsion for Phantom Express. The AR-22 engine is capable of generating about 375,000 pounds (170,097 kg) of thrust and was designed to fly 55 missions with service every 10 missions. This reusability feature makes the AR-22 ideally suited for Phantom Express. The reusable Phantom Express spaceplane will take off vertically and land horizontally. The vehicle will be equipped with an expendable second stage capable of placing up to 3,000 pounds (1,361 kg) of payload into low Earth orbit. 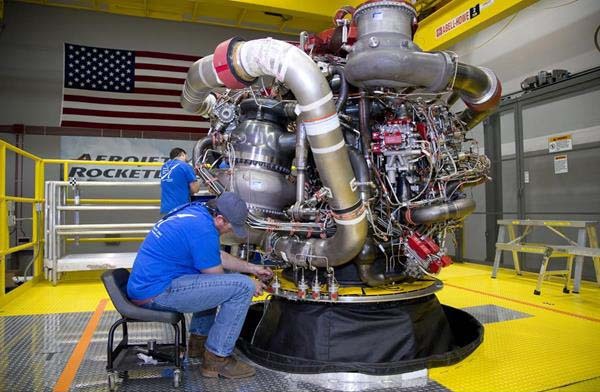 Aerojet Rocketdyne assembled the AR-22 at its facility at NASA’s Stennis Space Center in Mississippi. The engine will undergo a series of daily hot-fire tests at Stennis starting this summer to demonstrate its ability to support the high flight rates envisioned for Phantom Express. These tests will also provide valuable insight that will be used to refine Phantom Express flight and turnaround procedures, while also informing the design requirements for the new ground infrastructure that Boeing is developing for the flight program. Being able to deploy nearly 1.4 tonnes of payload into orbit a day could place more than 40 tonnes of water to an orbiting solar powered propellant (LOX/LH2) producing water depot per month, nearly 500 tonnes of water per year. So this reusable space launcher would be absolutely revolutionary! ??? If it’s water you want in orbit the tanker version of the BFR will do a 150 tons in a single launch for under $10 million. This system will be outdated before it flies. Its outdated now, its been outdated for about 2 years. Phantom Express may be the launcher DARPA has in mind for its’ Blackjack LEO constellation plan. If it ever comes to a shooting war, though, LEO is likely to get polluted quickly with orbital debris and maintaining the constellations would be difficult. A possible solution to this is to put the satellites into lower orbits where they (and any debris) will naturally decay and reenter in weeks rather than months or years. Of course, this implies the need to continually refresh the constellations with new satellites. Doing that with Phantom Express would be very expensive. Perhaps DARPA should consider reviving the SHARP project from the 90’s. Actually, if you could get the per satellite price way down, then it becomes cost prohibitive for the bad guys to shoot at them. No one is going to take out $20K satellites with million dollar missiles very long. DOD would do better to develop their own 2nd stages to ride on Falcon boosters. We’ll know this year if the Falcon 9 is capable of operating like a squadron of aircraft. If so, Falcon is the logical base for a operationally responsive launch vehicle. I think having a squadron of Falcon 9 rev 5 boosters operate like the SR-71’s does not seem out of the question. Yes they’re maintenance hogs, and expensive, but you can operate them on a responsive basis. When the USAF puts out a RFP for developing an operationally responsive space booster, SpaceX will be be able to come in with a quote on an operational system with years of flight history. A blast from the past, indeed. Because it is unmanned, because it is scaled down, because of the more modest reusability goals (expendable 2nd stage), the Phantom Express is the quick-turnaround economical cargo transport that NASA had originally hoped for but failed to get with the Space Shuttle. If only NASA had fielded something like this in 1977! The question is, does the success of the VTVL concept as exemplified by the Falcon 9 indicate the VTHL method of the Phantom Express is already obsolete? LOL! That is like saying it’s better to fly 200 passengers across the country in a 100 Cessnas than in a single jet liner. And don’t count on them being cheaper to build that the BFR, this is Boeing you are talking about. Yes, it would be a much better solution since each could launch multiple satellites as needed. Can you define “economical” and “cargo” please. Since the Phantom Express will be designed to be launched on a– daily basis, just one vehicle will be able to deploy more than 496 tonnes of water into orbit annually. Just ten simple space planes would be able to deploy more than 4960 tonnes of water into orbit annually. Even if you launched a titanic 38 engine BFR every month for a year, it couldn’t even deploy half as much water as just ten tiny space planes could in a year.